This photo was taken on Monday, down at Point Chevalier beach. 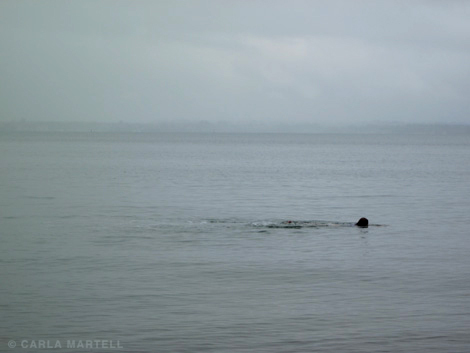 The kids had a day off school and my friend and I took them down for a swim, but the weather was strange - misty, muggy and incredibly still - and there was a giant full tide, just after last week's full moon. The boys were acting like madmen; screeching, swearing and whacking each other with driftwood, so we decided they were under the moon's crazy influence and took them home before they killed each other. The next day, Christchurch was shattered by a violent earthquake, which was the beginning of another kind of craziness. Being so familiar, so close, so much part of our history, the scenes of destruction are surreal and still unbelievable. Those sedate English names of streets and suburbs - Shirley, St Albans, New Brighton, Manchester St, Cathedral Square - are so at odds with the never-ending images of flattened buildings and crushed cars. Then there are the people we know down there; friends and family, and the anxious wait to hear that they are safe. Mine are (some with lost homes), but the latest death toll stands at 113, with many people still unaccounted for. I keep deleting what I'm writing here, because I can't find the right words for such a big, horrible thing.